Could Canadian government vote in favor of a law that makes nuclear weapons illegal? Your election as Prime Minister of Canada more than a year ago brought freshness and a hope that a better world would be possible. Your decision to stop participating in the attacks in Syria was a promising start, showing lucidity and courage. However, in view of the deteriorating global political context, your government is now changing direction to blindly follow the brutal and imperialist US policies that endanger the very survival of our humanity. A more than surprising and even completely unconscious decision was also made by the Canadian government in October 2016 when it voted NO to this wonderful UN proposal of undertaking negotiations to remove and make illegal all nuclear weapons http://www.icanw.org/. While it is clear to everyone that the nuclear threat is likely to wipe out all life on this planet, the fact that 9 countries now own more than 16,000 nuclear bombs, with automatic response systems in case of missile attack in each of these countries, represents an almost uncontrollable global danger. Whether it could be the decision of an aggressive leader, a technical failure, a human or communication error, or even an act of terrorism, everything can explode at any time. From then on, it becomes clear that only one solution can save mankind: we must suppress all these nuclear weapons as soon as possible. ICAN’s proposal is essential to the survival of humanity. As recently mentioned by Rael, the spiritual leader of the Raelian Movement: “This is the last chance we have of saving mankind and we have only 3 months to do so” raelpress.org. There is still time to react by unconditionally supporting the new legislation banning nuclear weapons during the UN vote in July 2017. Tension is increasing in the world therefore raising the urgency to act for peace and disarmament. Your support for the recent illegal bombing of Syria by the United States, which has shown no evidence of the Syrian government’s culpability in the use of chemical weapons, is extremely troubling! Your initial reaction to wait and demand that an inquiry be made, approach filled with wisdom, was followed by a radical about-face. This is all the more surprising given that in 2013 the Obama administration had similarly claimed the same kind of chemical weapons used by the Syrian government. However, the UN investigation concluded then that this was not the case and that the responsibility was instead the action of rebel factions supported by the United States. We also remember the famous “weapons of mass destruction” in Iraq, under Georges W. Bush, which proved to be nothing but lies to incite the American people to war. All these events can only invite prudence and detachment on your part from this very dangerous American imperialism. 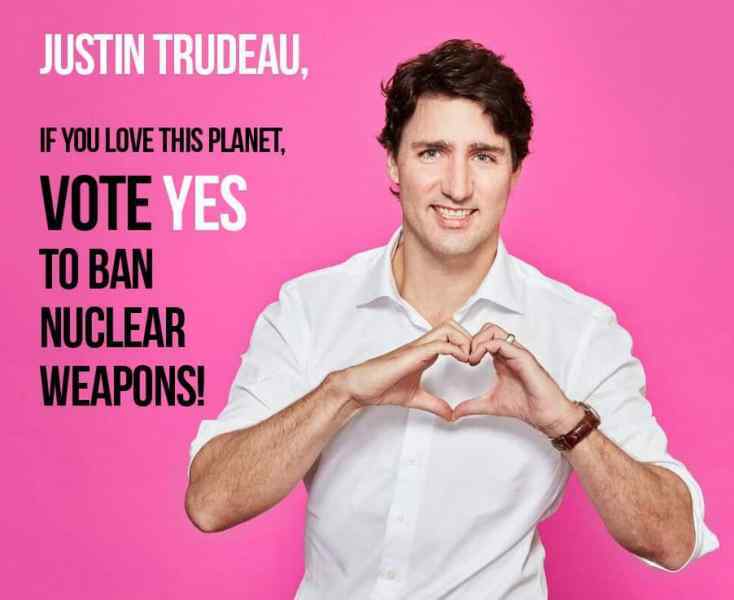 On behalf of all Canadians and all citizens of the world, we ask you to reconsider your decision and support the July 7 vote to ban nuclear weapons. Your support will have a very powerful symbolic value for the remaining hesitant countries. If the fate of your children and all the children of the world is close to your heart, and if the life of all that is alive is valuable to you, then you must support this ICAN project at the UN. We are confident that the compassion and love of mankind will triumph over the pressures and interests of the rich and powerful who lead us straight to self-destruction.